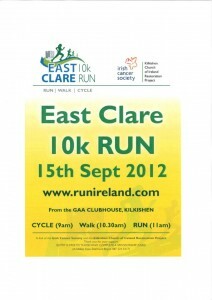 East Clare 10k Run Comes Around Again. 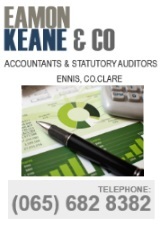 The location of the event is: Kilkishen, Co Clare…. There are 4 categories as follows: Senior Male, Senior Female, Male O/40 and Female O/4. 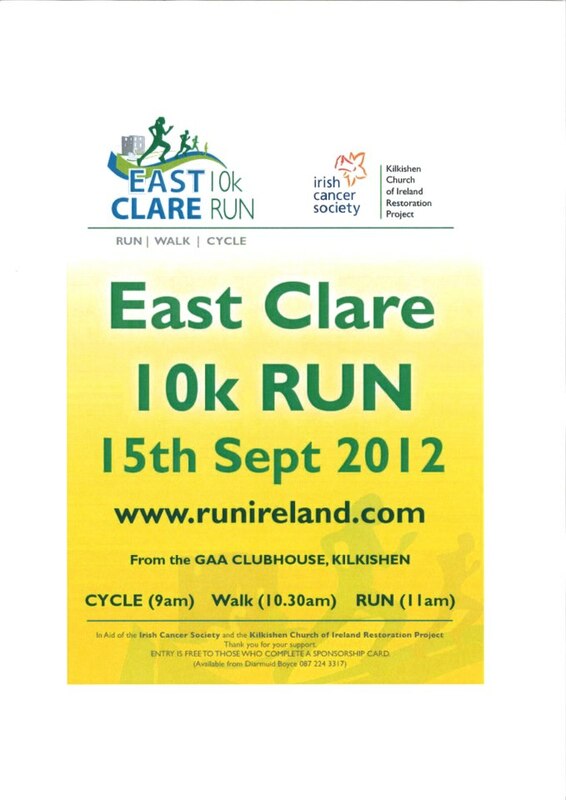 This is the 4th running of the East Clare 10k at Kilkishen in Co Clare and along with a competitive 10k it also includes a fun walk and cycle along the same route. The 2011 winner of the 10k was Sean Hehir of Rathfarnham WSAF in a time of 30mins and 27secs. In second place was Michael Shannon Kilnaboy AC in a time of 31.45 and 3rd was Shane Scully Nenagh Olympic in a time of 34.05 . Sean Hehir was also our 2010 winner in a time of 30.30 and the 2009 winner was Charlie Chalk from Limerick AC. The past 3 events have raised a total of €17,000 for the Irish Cancer Society ( cancer Reaserch ).